We went to Kettle's Yard in Cambridge this weekend, a favourite place which feels like the home of an imaginary uncle, wealthy and brilliant, but very welcoming, the house actually full of the private collection of one Jim Ede - many paintings of boats by Alfred Wallis, many drawings and sculptures by Gaudier-Brzeska, and much more besides - a spiral of round pebbles arranged on a bedside table, a big table to sit at and browse an eclectic library of art books.. It's a special place and if you've never been, go. I met artist Paul Coldwell there, preparing to give a talk (which sadly I had to miss), about his residency there. 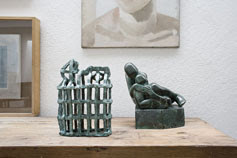 He's produced a range of sculptures to dot amongst the permanent collection, bronzes inspired by the house and conjunctions of the objects there. 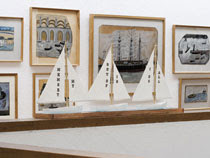 On a bookshelf is a screen showing a looped video of a poem/text over footage of the breakers at Aldeburgh. The show's title is 'I called while you were out'. We're talking a lot about publisher as curator, so it's good to look at some stunning curation, and these artworks which come out of an appreciation of the collection, which act as tangible conversations about and between different items. In these disquieting days, there's a need to go back to the home and make it safe to cope with whatever storms are on their way to engulf us. Arranging our things, hopefully not like deckchairs on the Titanic, but more like worry beads or talismans, held close and rubbed to bring luck or, if not, reassurance.